Let’s check out more shopping malls unique raya decorations and also the exciting activities during Ramadhan and Raya. DA MEN Mall the destination for festivals and celebrations in USJ, recently celebrates the Hari Raya festivity with ‘Jewels of Aidilfitri’. In the spirit of Ramadhan, the mall is decked with vibrant yet elegant decorations, that are inspired by the beauty of Moroccan mosaic motifs and geometric patterns which gives a touch of modern twist yet mystical experience. As you enter the mall, there are plenty of festive promotions, bazaar, fun arts and crafts activities and captivating performances, and the main highlight is at the Atrium area at Ground Floor. DA MEN Mall is set to be the destination for festivals and celebrations in USJ. 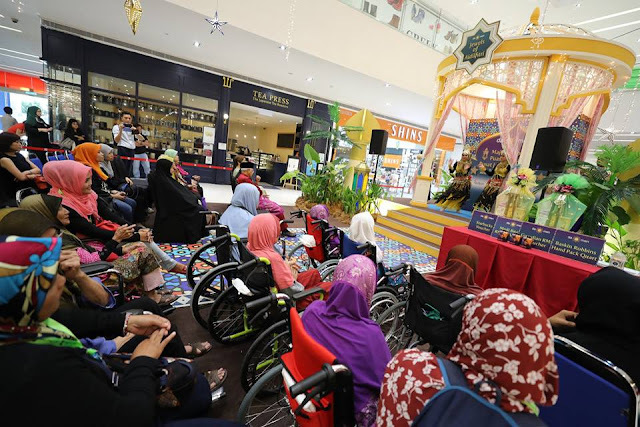 To bring joy to the festivity, the senior citizens of Pertubuhan Kebajikan Pusat Jagaan Sri Mesra were invited to the mall for a special celebration to join in the merriment of the launch, in line with the DA MEN Mall Community Programme which was designed to connect and engage with communities. 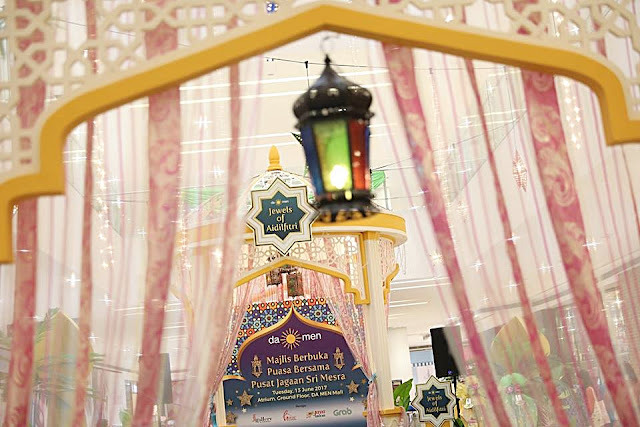 A medley of classical Hari Raya songs performed by instrumental band, Sweet Notes Jazz kept the mall festive. 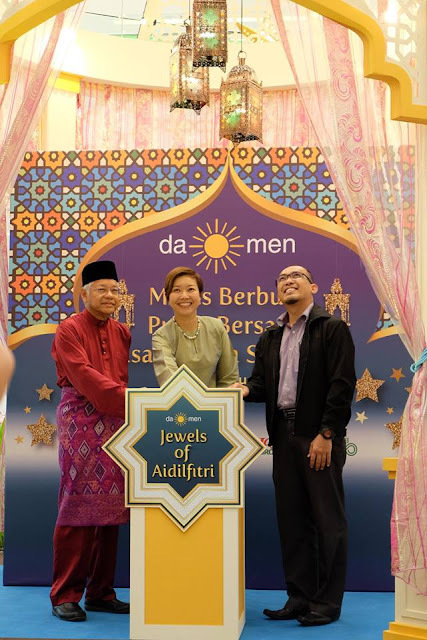 At the launch, Ms Elena Lee, General Manager, DA MEN Mall and Encik Azfarizal bin Abdul Rashid, Deputy Director Corporate, Majlis Perbandaran Subang Jaya lit up the festive lights of ‘Jewels of Aidilfitri’. The guests were treated to an energetic Moroccan dance which brought everyone to their feet to dance along. The senior citizens were then invited to shop for new shoes, accessories and home items, sponsored by Shoes Gallery & Home by Parkson. With over 40 F&B choices in the mall, Bali & Spice located on the Lower Ground Floor was selected as the Buka Puasa venue. Bali & Spice by Ole-ole Bali serves a wide range of delectable Balinese dishes, using only the freshest ingredients and aromatic spices in each dish. You can also enjoy special sharing menu promotion from only RM59.90 from now till 26th August 2017. To make Hari Raya shopping more rewarding, shoppers can redeem a free shopping bag with RM150 spent mall wide. There will also be free children workshops happening every weekend from now till 2nd July, where kids will have a fun time exploring their creativity in festive arts and crafts. You can also hop on GRAB Car and enjoy RM5 off their ride throughout this period. DA MEN Mall has over 130 outlets across six floors of shopping, dining and suburbia leisure. The mall is anchored by Shoes Gallery & Home by Parkson, Jaya Grocer, Popular, TBM, Chi-X Fitness and Kids E World. Shopping for great value is synonymous with the mall as it has the Adidas Outlet, OC Sneakers and a wide range of pop-up stores. New dining concepts includes Swensen’s, Ben-Li Express, Lim Kopi, Nam Heong and a dynamic cluster of casual dining kiosks and cafes on the Lower Ground Floor. Newly opened outlets include Canmake Tokyo, BeautiMe, Bread & Co. and more to be opened soon to add to the retail mix vibrancy. Wau, I have not been to this mall before, looks very nice to shop! What a great way to include the less fortunate in the celebration. I love that they were given the chance to shop as well!